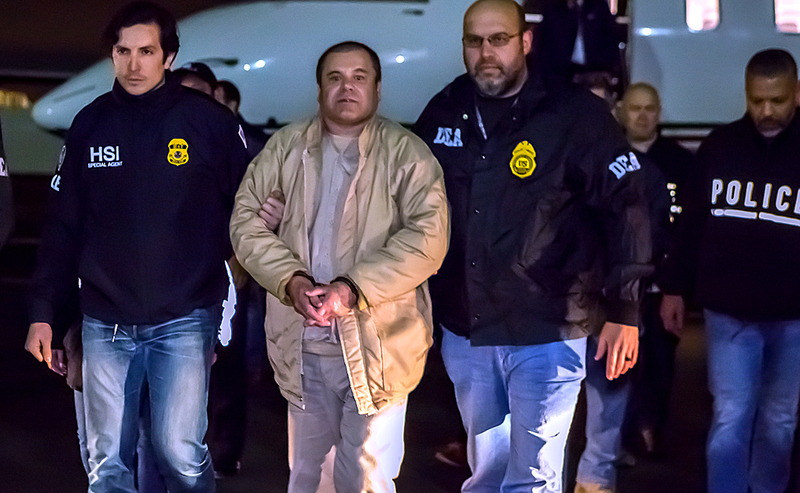 JOAQUIN “EL CHAPO” GUZMAN in U.S custody in 2017 (ICE photo). A federal jury in Brooklyn convicted Mexican drug lord Joaquin “El Chapo” Guzman of numerous drug trafficking counts on Tuesday. A sentencing hearing is scheduled for June 25 at which the 61-year-old criminal is expected to be sentenced to life without the possibility of parole at a federal maximum-security prison. The trial lasted three months and jury deliberation took six days. “El Chapo” is slang for “shorty” and despite his stature – 5-feet, 6-inches tall – he was a major figure in importing illegal drugs into the United States through his Sinaloa cartel. He was arrested several times – in both Costa Rica and Mexico – but was able to escape each time. He was finally apprehended in Mexico in 2016 and extradited to the U.S. in 2017. His net worth was – at one point– estimated to be $4 billion.